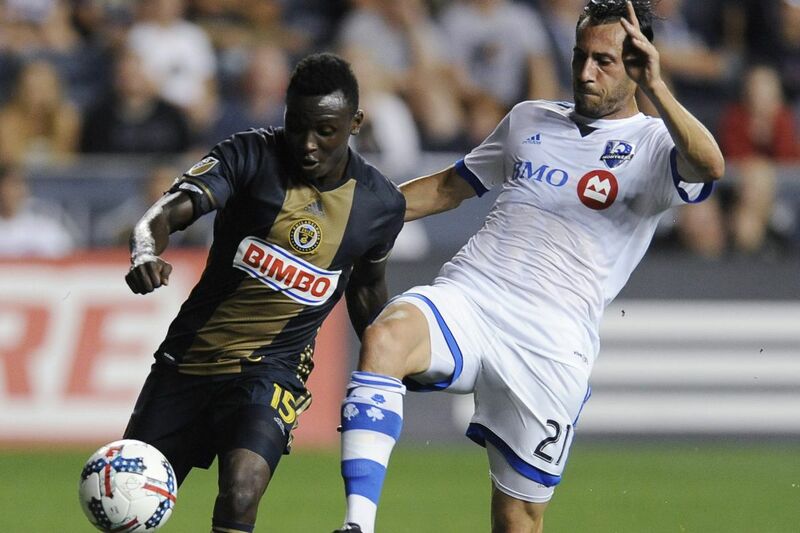 Union player Joshua Yaro (left) here battling Montreal Impact’s Matteo Mancosu for the ball on August 12, committed a costly penalty that got him ejected. For the second straight Saturday night, the Union had a much-needed win within reach but let it slip away. Their faint hopes of the playoffs likely slipped away as well. A 91st-minute long-distance header by Atlanta United's Tyrone Mears consigned the Union to a 2-2 tie at Talen Energy Stadium in Chester, after they had held the lead since the game's first goal in the 18th minute — and played down a man since the 52nd. "It feels like crap, honestly — it's so frustrating," said Union captain Alejandro Bedoya. "It could have been six crucial points right there, and instead it's only two, and it's disheartening. … I thought the guys today really rolled up their sleeves and put in the grit that we've been talking about that we need." Roland Alberg opened the scoring, finishing a lovely chipped pass over the Atlanta back line by fellow Dutchman Giliano Wijnaldum. Bedoya doubled the lead five minutes later with a bicycle kick finish of an Alberg corner kick. Jack Elliott got an assist as well, for re-directing Alberg's service into Bedoya's path. That made up for a clumsy yellow card foul by Bedoya in the 10th minute that earned him a one-game suspension for accumulated bookings. He'll miss the Union's Sept. 9 visit to Minnesota United. Before the fans could catch their breath, Atlanta pulled a goal back in the 26th minute. Greg Garza served up a cross from the left wing that Josef Martínez knocked down with a diving header to Yamil Asad, who was wide open and slammed a first-time volley past Andre Blake. That was the last big highlight of the first half, allowing the Union to enter intermission in a justifiably good mood. But things turned sour early in the second half, as Josh Yaro was justifiably sent off for colliding with a goal-bound Martínez in the 52nd minute. Yaro has now committed game-deciding errors in four consecutive appearances, all of which were starts. There was a deflection into his own net at Columbus on July 22, a turnover against Montreal two weeks ago, a last-minute penalty kick foul at San Jose last weekend, and Saturday's red card. Curtin said Yaro "made a decision that maybe wasn't the right choice," but the coach also gave the 23-year-old strong backing. Asked if the Union can afford to continue giving Yaro playing time, Curtin said bluntly: "You have to." "With young players, there's always going to be a learning curve, so he has to continue to go out on the field," Curtin continued. "Josh will continue to play. He's a young player that we believe in." After the ejection, Curtin moved immediately to patch the hole in the back line, withdrawing Alberg for central defender Richie Marquez. Curtin also made two more defensive-minded substitutions later in the second half. It all seemed to be working for so long. But then Mears popped up to get on the end of a punched clearance by Blake. As the ball sailed into the net, an announced crowd of 17,221 that included former NFL receiver Chad "Ocho Cinco" Johnson — a longtime friend of Union winger Fafa Picault — could only look on helplessly. The win, and likely any last hopes of making the playoffs, disappeared before their eyes. The Union (8-12-7, 31 points) now sit five points behind Atlanta and Montreal (10-8-6, 36 points), and both of those teams have played three fewer games.